The Suburban Mobility Authority for Regional Transportation or SMART offers rides to and from the McNamara Terminal with Route 125 running from Fort Street to Eureka Road and Route 280 covering the are of Middle Belt South, the North Terminal is served by the company's buses with Route 125. The FAST service is provided by the company as well. FAST delivers rides from the Detroit downtown to the suburbs making a limited number of stops. Route 261 that cover Michigan Avenue connects both of the airport terminals with the city center. The fee for a one-way ticket is about $2.00. The Ann Arbor Area Transportation Authority or AirSide offers public transportation service too. The buses are running from the city downtown to the McNamara and the North Terminals. The pick-ups and drop-offs of both companies are done in the Ground Transportation Center. 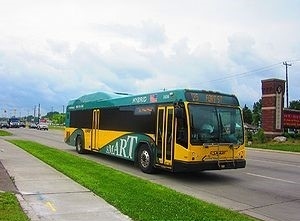 The Michigan Flyer or Indian Trails, Inc . connects the airport with Ann Arbor, East Lansing, and Jackson cities eight times daily. The fares for a one-way ride are $2.00 for those between 19 and 64 years old, $1.00 for those between 6 and 18 years old, $0.50 for elders who are above 64 years old and for disabled passengers. The services are provided 24/7; however, that would be better to book it in advance. The taxis depart from the Ground Transportation Center located on the 4th floor of the McNamara Terminal and from the upper level of the Ground Transportation Center of the North Terminal. The average fare for the taxis ride to the Detroit downtown will cost about $50.00; however, the certain price shall be discussed with the service provider directly.